I wish I was making that up. It was pretty much then and there (after practically running away screaming) that I realized not everyone in this world has the same sense of TASTE. 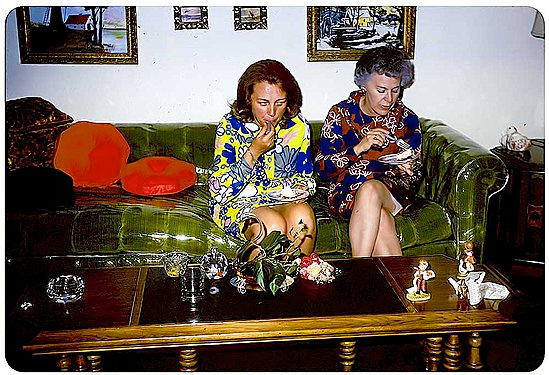 One of my cousins reminded me that our grandmother used to have these two large crushed velvet club chairs (in Christmas Red and Green) covered with age-yellowed plastic slipcovers. On hot summer days, we would all stick to them and lose a layer of skin, since she refused to purchase an air-conditioner. You gotta wonder about who makes those slipcovers, and I guess you gotta wonder about who buys them. My grandmother’s logic was to keep the chairs looking new as years went by, and I guess they did under those sheaths. But in the process, she prioritized the care of those 1960′s bad-acid-flashback-nightmare-pieces above the epidermal interest of her family. But, I digress. After a few layers of flesh grew back, and I began relating more visually to my surroundings, I realized, “Wait… Those things are not only dangerous, they look absolutely horrible too! !” I cringed a bit when in the same room with them, and got very hot. Maybe some hives. These feelings still come back once in a while, in a semi-Pavlovian manner. I was in a house some years ago and the owners had an amoeba-shaped glass-top coffee table with a ceramic base in the form of a cheetah, perched to prey on their La-Z-Boy recliner. The same place had gold metallic vertical blinds in most of the windows. Seriously, gold. 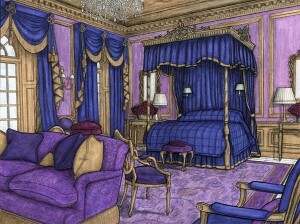 With teal carpet. 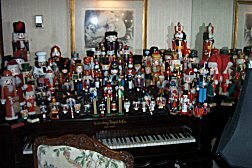 Another home I visited once (…and only once) had an obscenely large collection of Nutcrackers… covering about 90% of the surfaces. And it wasn’t like they put those bad boys out just at Christmas! This was in the middle of the summer! Can you imagine having all those eyes staring at you and those teeth ready to chomp down on… well, you get the idea. Now, I have to qualify a point, here. It’s not that I don’t appreciate irony in design. Or humor. I love a home that is fun. Or tongue-in-cheek. Those are my favorite, actually. 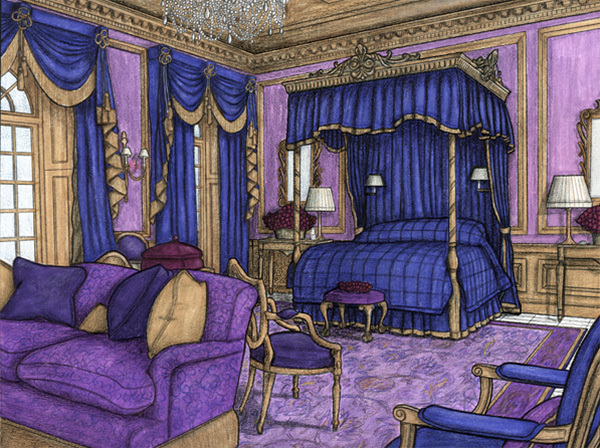 I’ve done concepts like “60′s Latin Bordello Bedroom” and “Baller-Superstar Loft” and “Vegas meets Versailles.” I love them, they turned out over-the-top fun, and were for very specific clients. The difference here is that we both knew that taste was being bended (at some points, disregarded) for a sense irony and fun. Know the rules first, then know how to break them. We KNEW about how crazy these ideas were and made choices based on that: a very theatrical presentation of a bold idea. This is a “Yes.” Fun, Bold, Over-the-Top. KNOWS it’s Ironic! It’s when someone doesn’t know he/she is being ironic that things go beyond simple mid-century kitsch to downright uncomfortable. We should all take a step back, have a look at our stuff, and ask, “Is this how I want to be represented?” If there is any doubt, or any hint of uncertainty, call a decorator. A plethora of snow-globes, Franklin Mint Collectors Plates, wreaths made of fake flowers, or anything ordered from the TV Guide are just some examples of extreme No-No’s. Framed 3-D Images where the eyes follow you around the room, collections of spoons/thimbles from a variety of souvenir shops across the globe, or any rotating colored fiber-optic lamps with or without musical accompaniment should be burned immediately. Not that I’m saying that anybody has to spend a whole pile of cash for a great look. My job as a designer is to help clients bring out their personal style in a functional (and yes, tasteful) manner; to help present their homes as the best they can be to the people who live there as well as guests. With a little time and effort, any home can be improved beyond a sofa trapped within a bad plastic slipcover. Taste can be learned, acquired, refined, expressed in different ways, and ultimately doesn’t HAVE to cost a fortune. More than anything, it just takes some time to get the idea, and looking at a variety of Home and Shelter magazines, going to better furniture showrooms and talking with a good decorator are great ways to start. We’ve all heard the saying that “Money doesn’t necessarily buy taste.” It’s true… just look at Trump Tower! This entry was posted in Help Me, Jesus, Hiring a Designer. Bookmark the permalink.